Heronrib Wet Area Safety Matting is the best wet area matting system where barefoot traffic is common. Consider Heronrib wet area matting for indoor and outdoor pools, locker rooms, saunas, jazcuzzi areas, and other wet areas. Heronrib is an hygienic, anti-bacterial, and anti-fungal option. Heronrib matting has a open grid PVC plastic construction and is self draining. 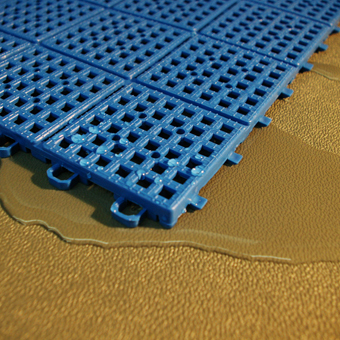 Heronrib PVC matting will provide a warmer and more comfortable flooring to stand on. It has a embossed texture surface for slip resistance. This wet area matting can be used outdoors because it is UV resistant. It is available in six colors including oxford blue, ocean blue, charcoal gray, forest green, mulberry red, and white. It is recommended that regular cleaning occurs with an alkaline based cleaning product and a brush or electric cleaner. This matting is also easy to roll up for cleaning the flooring underneath it. Available in sizes 2×33 feet, 3×33 feet, and 4×33 feet. For other wet area products, please visit our Wet Area Flooring page. After years of battling the cleaning, repair and hazards of a ceramic tile floor in its pool, spa and locker room areas, the Unity School District, located in Balsam Lake, Wisconsin, decided to try something new in the Fall of 2016 – and couldn’t be happier with the results. ”You could never clean it and get it scrubbed,” said Jeffery Allen who has been in charge of pool maintenance since 2010. He noted that he was constantly fighting calcium buildup and patching chunks that were coming out of the floor. The main issue, however, was safety, according to Maintenance and Operations Director Steve ”Dewey” Strilzuk. Laurie Paulson, who has been the pool manager at the Unity School District swimming pool for the last 15 years, estimated dealing with 5 to 10 slips or falls daily as a result of the hard, slippery tile floor. After being presented with the option of Life Floor Super Grip Ripple Tiles from Greatmats, the board of education and superintendent liked the safety features of the foam/rubber blended tiles, including slip resistance and cushion. Paulsen added that as a lifeguard and swimming instructor, she often works 11 hour days and the comfort factor of the Life Floor pool decking has made her life much easier. Her students love the new flooring for a totally different reason. Since the daily cleaning this grippy foam/rubber flooring is very different than cleaning ceramic tiles, the district purchased a new stand-on floor scrubber for the large areas and a smaller machine for tighter spaces, such as the locker rooms and bathrooms which now feature Life Floor Slate Tiles. Looking for a comfortable, low maintenance, and easy-to-install flooring for your pool area? Check out our Patio Outdoor Tile. It is perfect for outdoor use around wet areas because it is a drain through, elevated floor product. This flooring is also excellent for your hot tub or spa area. Its drain-through design will not absorb any moisture and lets all water drain through which will insure a consistently dry surface on top of the tiles. This will keep your surround safe from mold and mildew as well as provide a more comfortable area. This is critical because, if water is absorbed by your outdoor patio tile and freezes, the ice can crack and destroy your flooring. With Patio Outdoor Tiles, you won’t have that problem. As almost any parent will tell you, keeping children from running near the pool can be a full time job and sometimes they run despite your best efforts. It is imperative that your pool surround provide extra traction to keep everyone safe. Fortunately, these tiles provide that extra layer of security for your family and guests. They are also designed to be comfortable for bare feet. Patio Outdoor Tiles are perfect for use in a variety of wet areas including swimming pool areas, spas, showers, decks, and saunas. These patio tiles come in three attractive colors: blue, terra cotta, and gray. They are UV stable for outdoor use so you don’t have to worry about your tiles fading in the sun over time. They are also weather resistant so you can rest assured that they will last for years. Patio Outdoor Tile is designed to accommodate the weight of common foot traffic and residential tables and chairs for outdoor usage. Each patio tile is 11-5/8” x 11-5/8” and 1/2” thick. They are easy to install because they feature a unique interlocking tab and loop connecting system. These tiles simply snap together. You need no messy adhesives and, in most cases, you can simply design your own pool surround in a few hours. Use our handy online floor planner to determine how many tiles you will need. Easily cut this PVC floor tile with a utility knife for a total wall-to-wall installation and viola! You have an attractive, safer, and more pleasant area to relax in by your pool. But don’t take our word for it. Check out our customer reviews to see that, when it comes to outdoor, wet area flooring, Greatmats has got you covered!